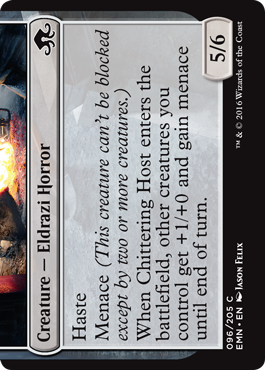 It's the last Friday of previews, and the entire Eldritch Moon Card Image Gallery can be found on our website. Take some time to look through the set—there is plenty of awesome stuff in there, and I hope everyone finds some cards they are excited to play with. 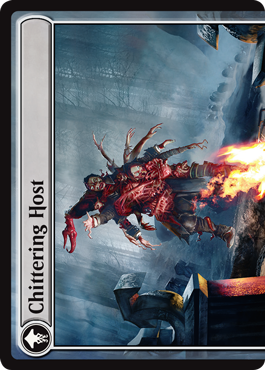 Today, I want to talk about the most notable aspect of Eldritch Moon—meld cards. 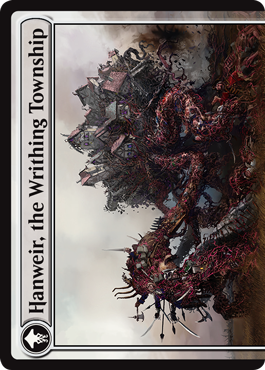 Both Ken Nagle and Mark Rosewater talked a lot about how they came to be in the design process, but as you may have noticed, the final versions of the cards are very different than the original cards submitted. Let's look at the process these cards went through to get to their final iterations. The first thing development needed to do when working on these cards was to figure out just how many would appear in the set. They are the flashiest thing to show off the transformation of things into Eldrazi, but realistically, they are just not going to happen as frequently as regular transform cards in Limited. 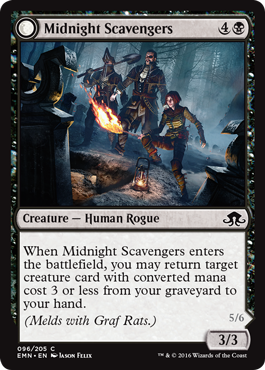 We wanted to introduce this awesome and flashy mechanic, but if it reduced the total amount of transforming in Eldritch Moon-Eldritch Moon-Shadows over Innistrad Limited to a fractional amount per game, then I think it would take away a lot of what makes Innistrad cool and unique. 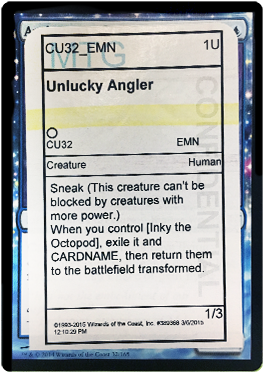 The first thing I did was cut the uncommon meld cards the design team handed off. The problem with having the mechanic at uncommon is that it feels like something you can do in Draft—but realistically, it's just not going to happen much. More than rares, for sure, but there isn't a big expectation that rares will happen in Limited. They are more of a Constructed thing. On average, you see slightly less than one of each uncommon per draft, meaning that in a huge portion of the total number of drafts, you will only see one of the two cards. Even when you do get one, the other card has to not only show up, but get passed to you. Meaning that at least one of the two needs to be weak enough to get through a huge portion of the draft. This combination felt like a real poor way to deploy the mechanic. Instead, we opted to keep the mechanic at either common or rare. Two common pairs of double-faced cards for meld would have worked, but they are not the only goal for DFCs in the set; we also want to show Werewolves and other types of transformation. We could've made almost all (if not all) of the uncommon DFCs into Werewolves to compensate, but that also felt like too much. 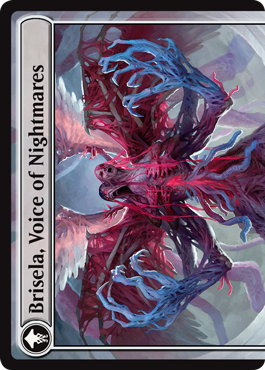 Double-faced cards are the strongest tool we have to tell the story of transformation, and we needed those slots to tell the individual Eldrazi transformation stories that the set needed. 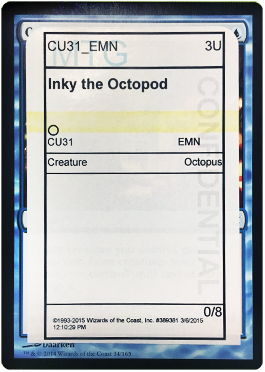 Once we knew how many were in the set, it was time to start making the actual cards. This is what was handed off from the design team. The idea was there, and many of the designers were enamored with the idea that two low-pick commons could combine into something bigger, but in my mind it had larger problems. First of all, placing it in blue was rough because blue has the lowest percentage of creatures by color, so taking two out of it that would really only work together was a stretch. We already had the white pair at rare and mythic rare, and we didn't want to double-up colors. Both green and red were going to be using Werewolves, so that left black. What I wanted to do from there was figure out the right story to tell with the meld cards. Talking with the creative team, one story they liked was to have some variation on the "rat king," which you can look up if you really don't want to sleep tonight. I was excited by the idea of allowing one half of the card to help get the other half out. Meld is a difficult mechanic to pull off, and any letting the cards go a bit out of their way to come together reduced the fun design space, but made the individual cards much more satisfying. The trick to making this one fun was taking two cards that were kind of middle-of-the-pack picks by themselves and combining them into more than the sum of their parts. We also needed to get to the point where melding them was a powerful play for Limited, but not something that would immediately end the game. We ended up on menace for it, and for your team, so that it could be powerful by itself or break up board stalls, but not generally win games where you were far behind and topdecked it. Getting the meld combinations to work in Constructed meant doing more than just making them powerful; it meant thinking strategically on how to give them the highest chance for success. Having each pair just being creatures might work, but there would be an even higher chance for success if there was a way that one half could be a noncreature permanent. By setting them up in this manner, we could make something that could easily sit on the battlefield and wait for you to choose to activate it, thereby increasing the chances that people could play the maximum copies in their deck. We thought about Equipment and creatures that combined, or even an enchantment. 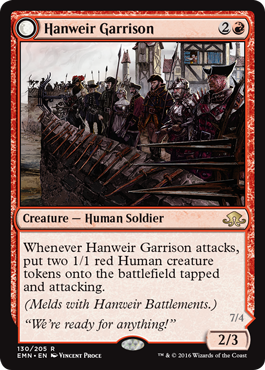 Before designing it, though, I talked with the creative team, and they told me the story of Hanweir, and how it would fit into the paradigm I was looking for—which was perfect, since getting a land into your deck has about the lowest barrier to entry of any permanent. It would set a pretty low barrier for getting the card into your deck. 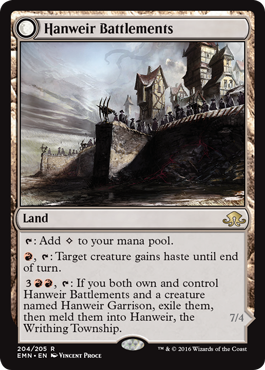 Our version of Hanweir Battlements was always pretty similar; using mana to transform instead of a triggered ability meant that we could balance it without worrying about people doing it too early in the game. It was also just the most useful knob we could create for fine-tuning the power of the card. 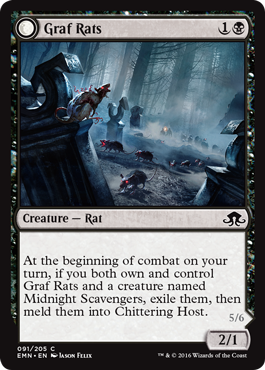 Giving your creatures haste was a nice way of making the card strong enough to appear by itself in decks. The ultimate goal of these cards was that at least one half of each pair would be just about strong enough to appear in Standard decks by itself, so the combined value of the two together would get you to actually do the thing. While we haven't seen any Standard tournaments for Eldritch Moon yet, I am confident that this little combination will see the light of day. This is the pair that started the entire mechanic. It all started when a concept artist drew the horrible fusion of Bruna and Gisela, and that led Ken Nagle to try out a Duel Masters mechanic he had attempted to get into Magic a few times before. 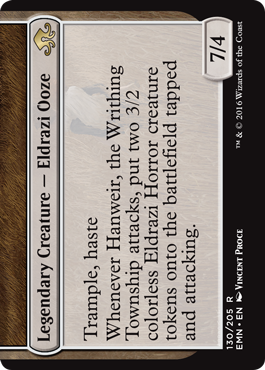 Much like Hanweir, the hope with these two was to make it so that you would run one or the other as the main creature in your deck, and due to the value of the meld, run at least one of the other so it would happen sometimes. The most obvious one here is that decks that run Gisela as an efficient flying beater can go to running one Bruna. 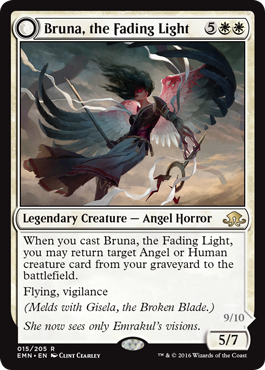 Or, decks that want to use Bruna as part of a reanimation package can get full value by returning Gisela. 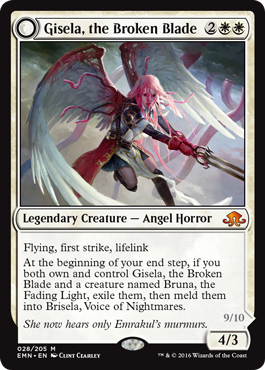 The challenge for getting these two right was largely in making sure that the reverse side was strong enough to get you to want one Brisela as opposed to having both Gisela and Bruna on the battlefield. 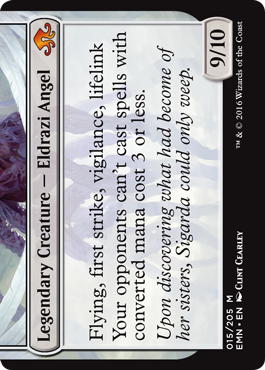 We opted not to use an enters-the-battlefield trigger but to try something else—and in addition to just allowing vigilance and lifelink's scaling, we went with an ability that would keep your opponent from playing many of the most popular ways to remove creatures from the battlefield. Much like the other meld combinations, we wanted something that was powerful and imposing, but also something that could be beaten. The meld action is the most fun when you actually get to attack with it, rather than your opponent just scooping the second it resolves. It was very difficult to come to the final versions of all these cards. Much like the Magic Origins planeswalkers, these cards had a ton of knobs to work with, and they were uncharted territory, so we didn't have any easy things to crib off of. Overall, I am very happy with how they turned out, and I hope that you find them as fun as I do (and take as much joy as I did when attacking with a double-size creature!). That's it for this week. Join me next week when I talk about emerge as a mechanic.